I love Japanese fashion. There's no denying that my heart throbs furiously when I hear that so and so brand is from Japan. It might be the fangirl in me that's hijacking my brain but Japan is love and vice versa. So during my last trip to Singapore and my more recent online adventures, I decided to go nuts on my favourite brands. To date, the topmost on my list happens to be Emoda. 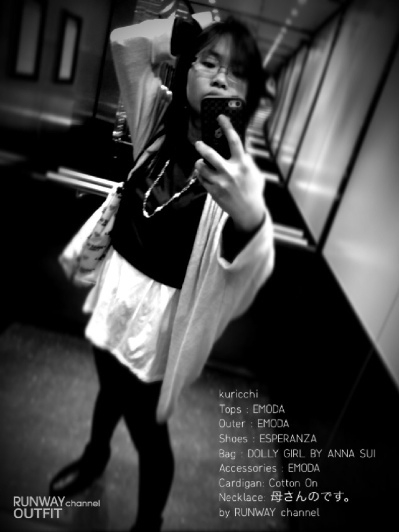 I thank Cheesie for blogging about it constantly although my special thanks goes to Ena, the producer of the brand. If she hadn't come up with a concept that speaks to me, I would never have considered converting my entire wardrobe. To begin, Emoda is considered Neo Gal for it's MODE trendiness. The concept is inspired off both pop and art culture. Most of Emoda's pieces consist of white and black prints which are my absolutely favourite colours in the world. Monotone is simplistic and easy to match. It's great that they're willing to take something so simple and convert it into various seasonal concepts that are unique and outstanding. Anyway, let me go through all my Japanese branded purchases over the past 6 months with you. Out of the collection here, I've been using those Esperanza shoes the most. The boots are just too comfy and well suited for Aussie's rainy winter! The Celegossip dress is really thick and warm. I love how my upper body looks fantastic in it. Quite impressed as I wasn't sure if it would look good on me. The Lowry Farm's dresses... Whilst I had enjoyed wearing them, somehow doesn't look good on me. More specifically the last dress. It really makes my forearms and thighs stand out for being super thick. Ugh! I need to remedy that. So I didn't managed to grab a picture with my purchases but here's one of me dressed in some of them. 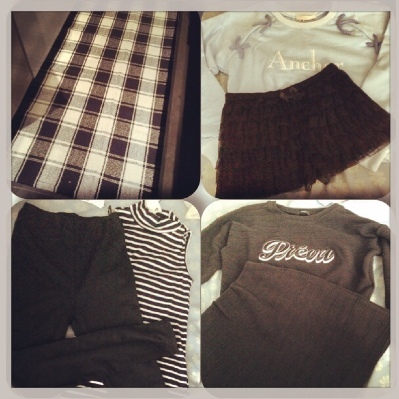 Bought a couple of tights, a cropped top, boyfriend shirt, white bangle and stripped shirt from Emoda. In this picture, I'm dressed in the cropped top and boyfriend shirt with the bangle and my mom' sold pearl necklace to finish the look. It's one of my favourite Winter coordinates and I tend to wear it as often as I can. These were purchased from their Global webstore which ships internationally worldwide. 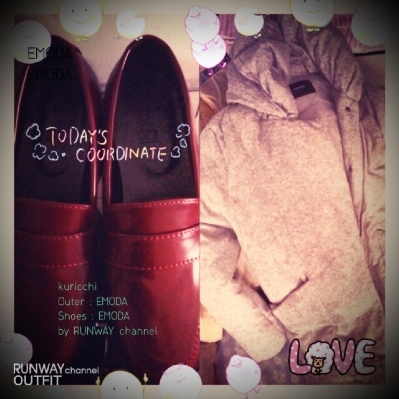 Then this GW sale, platform red shoes from Emoda and a winter jacket to replace my old jacket. From left to right, Emoda's April novelty gift rug nicely laid out on my kitchen floor, Littny's trainer top and free tutu pants gift (unable to wear it because it's too small and not made of stretchable material), Resexxy's stripe dress and pants, and lastly, Emoda's Prevu set up. These were all purchased from Runway Channel, a website that compiles all Mark Styler branded clothes into one convenient one stop online shop for shopping. As they only shipped to addresses in Japan, I had to use a forwarding company, Tenso, to get the items shipped to me. Thankfully, GW meant free shipping to the Japanese address so I didn't have to double up on shipping fees. 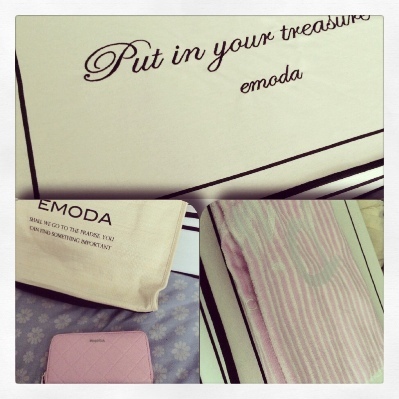 In this picture, there's Emoda's May novelty pin up box and stripped blanket. 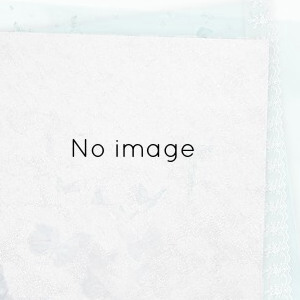 I also purchased their 2013 Summer happy bag (fukubukuro) and their sout pink wallet. I had wanted the black wallet but a mix up had occurred during my order process and I got the pink instead. Not complaining though. 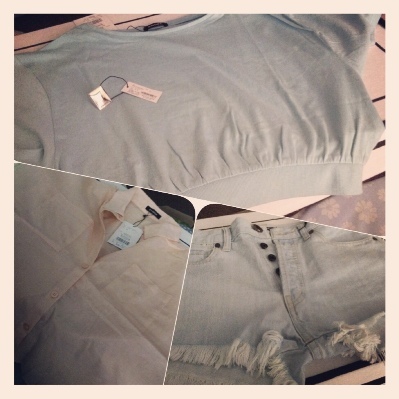 I love Emoda even if I'm not a pink fangirl! And here's the fukubukuro contents! Two cropped tops, a ring and a hot pants. The fukubukuro was sold for ¥7,900 but the value of the items were worth easily ¥20,000. This was such a stellar deal. I was worried that I wouldn't be able to fit into the hot pants though. Quite ecstatic that I did. I remembered during my Singapore trip that I was heartily dismayed by my inability to purchase a single Emoda piece due to being unable to fit into anything. I even emailed Cheesie talking to her about it. Luckily, she was a great sport and encouraged me to try buying some of the items on the web store, which has been my best experience by far. 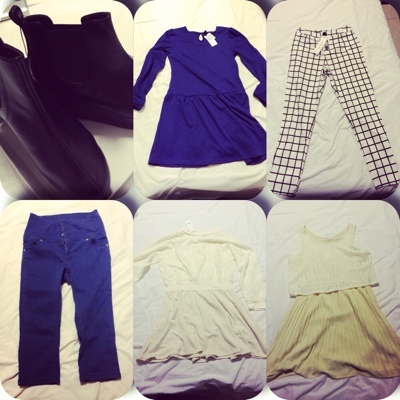 I didn't include my purchases from Muji and Uniqlo though as they were mostly inner garment pieces! *laughs* it's not all that bad but my style of dressing is definitely changing and moving slightly further away from oversized t-shirts!